UDM Downloads > Advanced Grapher! 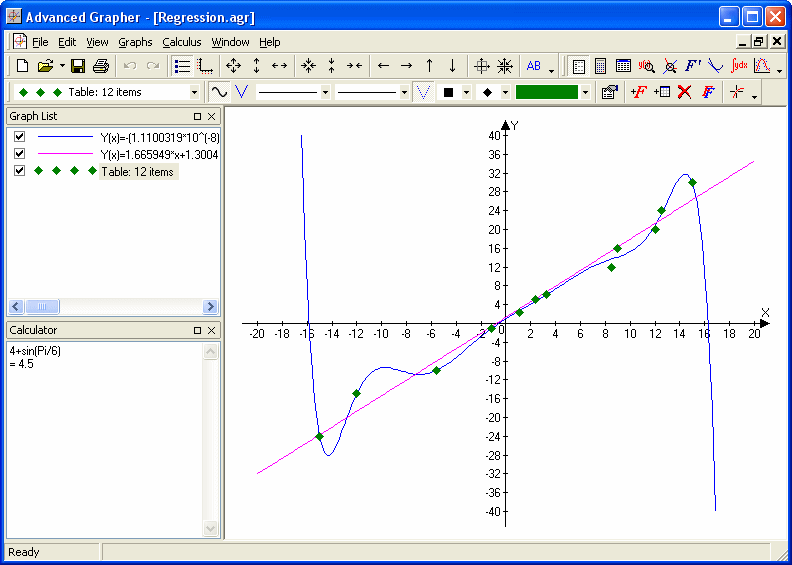 Powerful but easy-to-use graphing, curve fitting and calculating software. Graphs Cartesian (Y(x) and X(y)), polar and parametric functions, graphs of tables, equations (implicit functions), inequalities and systems of inequalities and slope fields. Up to 100 graphs in one window. Calculus features: regression analysis, obtaining zeroes and extrema of functions, intersections, derivatives, equations of tangents and normals, numerical integration, value tables, calculator. Lots of graph and coordinate plane parameters. You will be able to create high-quality graphs and copy them to your documents (as EMF or BMP). The program has printing capabilities, multi-document interface, customizable toolbars. Supports English, Dutch, French, German, Italian, Portuguese, Russian and Spanish interfaces.